After having a successful run on the current consoles, Tecmo Koei now looks to bring their voluptuous beauties to the PlayStation Vita in Dead Or Alive 5 Plus. Along with retaining as much as possible, some new features have been added to make better use of the Vita’s touch options. 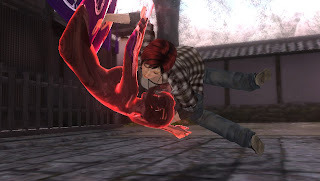 So does Dead Or Alive 5 Plus prove to be a great fighter on the handheld? Or do the bouncy competitors prove to be too much to handle? Story Mode is where the game’s plot is told and this is done through various chapters involving interconnecting storylines between characters on the roster, therefore not being told in chronological order. To summarise, Dead Or Alive 5 takes places two years after DOA 4 in which Helena saw the destruction of DOATEC and now looks to rebuild the company and its reputation, utilizing its technology for more peaceful means. In doing so, the biotechnology division was destroyed and all employees and projects were gotten rid of also, now Helena announces a new tournament to prove to the world that the new DOATEC is now on the right path. Helena and Kokoro enjoying a... drink? As I noticed, there were two storylines, one regarding the fifth tournament and the other looking at the hunt for Alpha-152. Characters from both storylines interact with each other but not in any meaningful way, which is a shame seeing as they really could have pushed that and have character relationships become a factor. Instead we’re presented with random situations which usually end up becoming a random fight. For someone like me who’s new to the DOA series, I found the story mode to be more confusing then educational and while I liked the fact that it goes back to previous events to keep the player up to date, the sequence in which the plot is told has a lot more to be desired from it. You understand the end goal and what the characters are trying to achieve however I found the lead up to it to be uninteresting and dull. Dead Or Alive has always been known for its combat and the PlayStation Vita version of Dead Or Alive 5 Plus does not disappoint. The game is open enough for beginners to pick up simple combos and strategies while offering those serious players the option of pulling off longer combos and parrying an opponent’s moves. The controls are tight and I felt no delay when moving or performing attacks. What I really enjoyed however was the fluidity of the combat and how almost precise-like it was as you can pretty much dodge a move by a fraction of second without hitboxes and such playing a factor. Another thing worth mentioning are the stages you fight in as some of them include up to three different levels and most being pretty dynamic. Some of these stages can be a big game changer during battle and something I feel that adds a strategic element to Dead Or Alive 5. So there are several modes on offer but for the newbies like us, training is where you want to go when the basics are what you really need and DOA5 Plus offers pretty detailed instructions to bring you up to speed and help you become a master in no time. The tutorial itself practically covers everything, from general movement all the way to advanced rising techniques to your opponent can’t constantly attack you when you’re down. It’s really impressive and should prove very useful for those who wish to get into the game not to just play on par with friends but compete online and in tournaments. Other modes in the game include the standard Arcade Mode in which you fight opponents one after the other and are then ranked on a leaderboard at the end. Time attack is essentially the same except it challenges you to beat each stage as quickly as possible and last but not least, Survival which has you go up against an onslaught of opponents and tests to see how long you can survive. One thing I found confusing was the absence of tag battles, something that is featured in the game’s story mode but is not available for standard versus or online. HUD for touch controls. Swiping up lifts the opponent into the air. A new feature included in the PlayStation Vita version is “Touch Fight”. This basically allows you to use the touch screen to fight your opponent rather than standard buttons you’re used to, this is done through the use of swipes either up, down, left or right to attack, along with tapping and pinching the screen to grab and defend. Generally I found this control scheme to be a lot harder to use and interestingly enough, I felt that going this route made the CPU a lot easier to defeat. Overall it’s a nice little feature which can serve as a good change of pace if you’re up for the challenge. Throughout the game you will be able to unlock extra’s such as titles for use online and costumes for characters although you may see a CPU in costume, it may not necessarily be available as an unlockable in the game. As with the console version, the PlayStation Vita also gives you the option to take your skills online and show your stuff against the world. You can battle it out in a quick and simple one on one or take things a little more seriously where you rank is affected. There’s also the Online Dojo where you can invite a friend to partake in practice matches, a good way in my opinion to prepare yourself for any delay you may experience during a fight. The actual experience itself I felt was pretty solid. Yes there is a slight amount of lag but nothing that you wouldn’t be able to adapt to and certainly nothing that would affect the execution of your moves. When searching for a match I chose to fight anyone who had a copy of the game whether it was on the PlayStation 3 or PlayStation Vita and even so I was still able to enjoy a match with a stable connection. Most people would agree with me that when it comes to Dead Or Alive titles, they’re usually pushing the line when it comes to their visuals and Dead Or Alive 5 is no different. While the PlayStation Vita can’t replicate the same quality as the PlayStation 3, Tecmo Koei have done a great job in optimising it for the handheld in a way that still makes the game look great and in some ways, extremely close to its console brother. 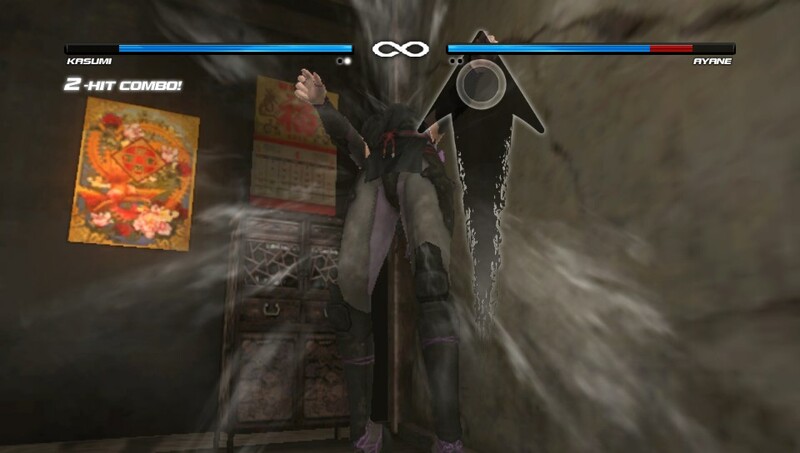 Most aspects have been retained from the console version including the use of sweat and dirt which allows for a characters appearance to be changed during a match. While not as strong visually on the PS Vita, Tecmo Koei still did a great job. For the majority of the game, the sound work is fine but I do like how they catered the background music to the theme of the stage for example, the circus stage makes use of the standard fanfare to create what is the atmosphere for such a place however it’s not just the background music as there are many things happening in the background of a stage. Whether it’s a lion jumping through a hoop or tanks blowing up, there are many background sounds floating around too, most notably in the “Hot Zone” arena where a full blown war is happening around you therefore making use of everything that surrounds the stage. In short, Dead Or Alive 5 Plus successfully brings the detailed and intense battles from the console version in to the palm of your hands. While the obvious thing being that the visuals had to be optimized to work on the PlayStation Vita, it’s good to see that factors such as the characters sweat still looks as good on the handheld. Now with most fighters, the story mode was a bit messy and the touch controls while different, felt a little tacky however Dead Or Alive 5 Plus is a solid fighting game and probably one of the best on the PlayStation Vita.